Your twins are still progressing at a rate comparable to singletons at this point. They are around 4 pounds each by week 32 and approximately 16 inches in length. They have gained more fat which has helped to fill out their wrinkled skin. This accumulation of fat will be crucial in helping them regulate their body temperature once they are born. Their skeletal structure is complete, although the bones will remain soft and flexible until the last eight weeks when they start to store calcium and iron. The size of the body is catching up in relation to the size of the head, which seemed disproportionately larger until now. 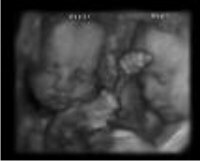 These babies are almost ready to meet the world with all major development complete aside from the lungs. 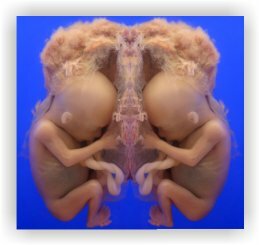 Many a mother carrying twins will tell you how uncomfortable they are starting to get at this stage of pregnancy. Fatigue has become more pronounced and it is becoming very hard to find a comfortable position to sleep, let alone sit. You may find it helpful to use a "pregnancy pillow" which helps get into a variety of positions with a little more comfort and support. Swelling of the lower extremities may be occurring regularly now, especially if you don't take time to put your feet up throughout the day. Back pain may start or worsen. Shortness of breath will be common, as it becomes more difficult to take deep breaths. And heartburn generally gets worse. Getting enough rest will be important, so be sure to take time out for yourself. Be sure to listen to your body, as preterm labor becomes an increased risk the further along you progress. 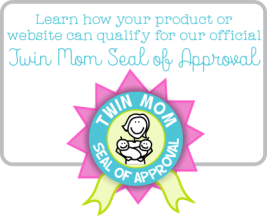 If you haven't already, you should be choosing a pediatrician for your twins.